FIRE STICKS: The video begins with a demo of the simple “fire-stick” method, in which the man rubs one stick between the palms of his hands, drilling it into a hole in another stick. CORD DRILL: Because this method gives him blisters, he builds something called a “cord drill” from nothing but a stick, a rock and handmade twine. He turns the rock into a wheel by pounding a hole through the center with another sharp rock. He simply inserts the stick through the rock wheel, ties the cord to the roughed-up top end of the stick, and then pulls both ends of the cord to create a drilling motion. PUMP DRILL: In a final improvement of the invention (which he says originated in ancient Rome), he creates a flatter wheel out of clay and ties a handmade stone “drill bit” to one end. He then drills a hole into a fatter stick, slides it onto the skinny and attaches the ends of the cord to it. This time, he’s able to simply “pump” or push down on the fat stick, instead of having to pull on the ends of the cords, creating a simple drilling motion. In the end, he decides he still prefers the simple “fire-stick” method, because the drills are too wobbly and take longer to get the fire going. However, he says he’ll still use his creation as a carpentry drill for making holes in timber for pegs, and he still recommends it for people with “soft hands” who don’t want blisters. 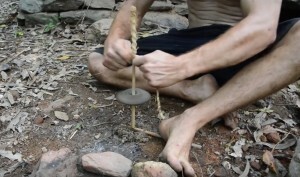 The mystery man behind the video has a whole series of demos on primitive tool making on his blog Primitive Technology. His name is never mentioned in his blog, but in the comments of his “about” section, he says he lives in Far North Queensland, Australia. He says his primitive tool-making is just a hobby. He mows lawns for a living, lives in a modern house and eats modern food. He said his inspiration comes from local aboriginal hunter-gatherers, who survive on wild food using only handmade stone tools. If you’d like to support his work, there is a “donate” button on his YouTube channel. We’ll definitely be sharing more of his earth skills videos here on Return To Now. Where there is no smoke, is there fire??? What tree sapling did you get the inner bark from? Also what part of the Country was this filmed in?